How much do you love these old electric outlets? Before we did the renovation for the Counts Brothers Building these old outlets were scattered around the upstairs. I put a multimeter on them and none of them actually were live, but they looked cool. I guess I should have kept them and made some art but it didn't occur to me at the time. 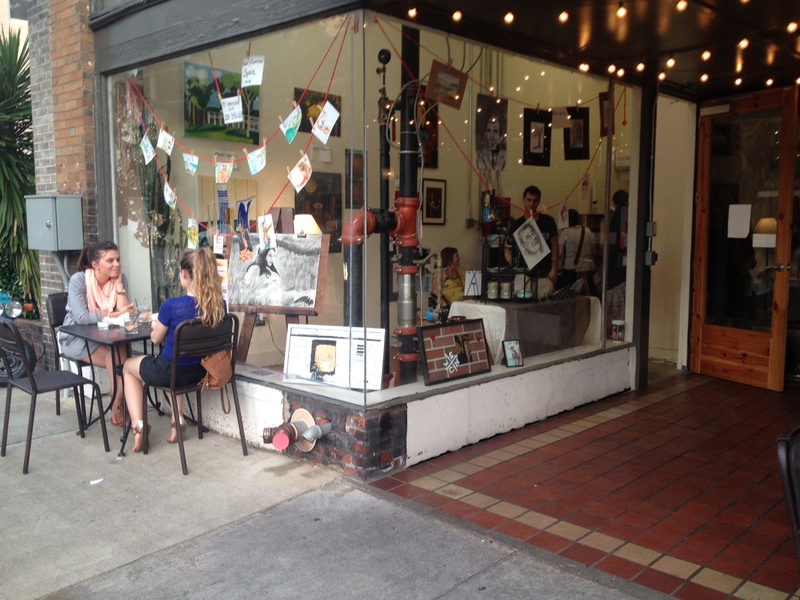 Come out to 2nd Avenue tomorrow for the Monthly Artcrawl. The Wade Smith Foyer Gallery will be hosting photographer Kily Payne and digital artist Nabih Iqal. If you're cold duck into El Barrio for something to warm you up! The Florentine recently opened as an event space. I haven't been lucky enough to go inside yet but the Accordion Player and I press our noses up against the glass whenever we walk by and it really looks beautiful. So beautiful, in fact, that I don't know that we will be invited because we might touch something. While they are currently only doing events and catering, they are supposedly going to open a restaurant very soon. I've been polishing my spats on the off chance that they will let us in. Bamboo on 2nd was also just announced. I'm particularly excited because we haven't had a sushi restaurant close to 2nd Avenue since Thai Bowl closed. Now we will have one right across the street! Our friends at Appleseed are doing the work, so you know it is going to look cool, too. 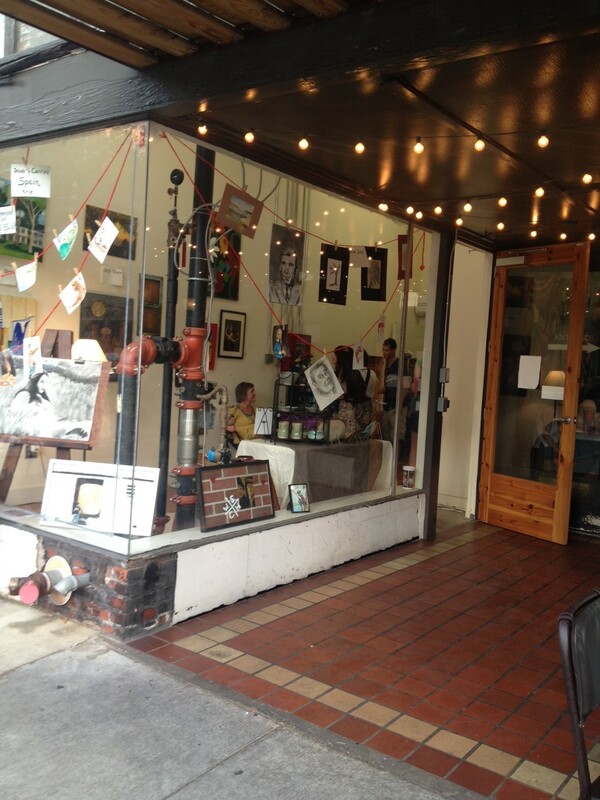 I entered the #decktheham window painting contest that Birmingham Artcrawl sponsored on 2nd Avenue this year. To vote for me Retweet, Share, or Repost and make sure to include #decktheham. Thanks! We're all set for the holidays. Come by and visit. Yo Mama's had their soft opening today, so the Accordion Player and I walked over for lunch. It's located in the old Faith Skate storefront next to Urban Standard (2328 2nd Avenue North), and just a block away from 2nd Avenue Storage. The decor is really cool. They kept the old brick and wooden beamed ceilings and gave it an open loft-style feel that fits really well with the rest of the neighborhood. They threw in some bright colors on the old plaster that make it feel really bright and exciting. The second thing I noticed after the decoration was the friendly staff who took a lot of time to talk to us even though they were pretty busy. One of the proprietors (Yo Mama's daughter apparently) told us that they kept the menu small to focus on making a few things really well, with the daily specials really being the focal point. After eating our meals and looking at the other dishes, I will describe the menu like gourmet soul food. The daily special really did look tasty but I'm a sucker for hot wings. The hot wings were delicious, and not your normal buffalo sauce on greasy previously frozen wings. The wings were really meaty and the sauce was sweet and sticky with just the perfect amount of heat. Overall, a great addition to the neighborhood! There is a wonderful article in National Geographic Traveler about the changing perception of Birmingham. A lot of it focuses on how the Downtown Revitalization has improved the metro area in general, and even mentions El Barrio! Read the article: Steel Magnolia -- National Geographic Traveler. Billie Dupree, of @MediaOkra fame, was looking for an affordable studio space, preferably downtown. I suggested that she transform one of 2nd Avenue Storage's storage units into a working studio. We have electricity, a utility sink, and it is air conditioned. Billie decided to give it a try and so far she's loving it, and we're loving having her here! Here are some pictures of her studio space. Note that we only post pictures and reveal tenants' names if they specially give us permission, and Billie said "go for it!" Billie described her new studio: "Because I'm happy! Like a room without a roof! I can sing that because I now have a private working art studio at 2nd Avenue North Storage in the heart of the Loft district! Thank you Wade Smith for the suggestion! I can now reclaim my kitchen and dining area back at home!" Catch MediaOkra's next show at the Joy Gallery. Opening reception is July 6th 1-3pm. Show is on exhibit through July 30. We enjoyed Artcrawl last month. There was a good turnout and the organizers did a great job. We transformed the entryway to 2nd Avenue Storage into "The Wade Smith Foyer Gallery." Cause it's my foyer, ya know? Special thanks to Billie Dupree for coming up with the name. Looking forward to next month's Artcrawl on July 3rd. Come on down to 2nd Avenue! I just read a listing for a walking tour of "Upper Downtown" given by Vulcan Park. The Vulcan Park folks are awesome and I bet this is a really interesting tour. Sign up here. However, I have no idea what "Upper Downtown" is. I assume they are talking about the area around Vulcan, with "Upper" possibly meaning "on the mountain." Personally, I would call this area Southside, but maybe that is too general, too. Which leads me to the question: where is "Downtown" Birmingham? Often, when people who live in the Loft District say "Downtown," they actually mean the Loft District, but that's not right. Most people in the metro area say the new Regions Park is in Downtown, but the signage in the area says "Midtown" and the city is trying call it "Parkside" (although I've never actually heard anybody refer to the area between Downtown and Southside as "Midtown" or "Parkside"). When people who live over-the-mountain say "Downtown" they usually mean what I think of as Downtown, Midtown/Parkside, and Southside as well. When you see a comment on AL.com about how dangerous "Downtown Birmingham" is, the commenters lump any part of the metro area they don't like into what they call "Downtown." It seems the further you live from whatever Downtown is, the larger it gets. REV Birmingham and other people who are a lot smarter than me have been working on branding campaigns for various parts the city. Considering that none of us seem to know where anything is, maybe that's not a bad idea. So what do you call the area around Vulcan? Southside? Upper Birmingham? Sub-Vulcan? So most of you will remember we used to call the Counts Brothers' Building the Storkland building. I had bought it from Tom Blair, and the last tenant had been Storkland, owned by Tom's brother Stan. Stan had kept Blair Furniture, his other furniture business, downtown in the same location next to the prior Storkland. Interestingly, El Barrio and the rest of the restaurants and bars on 2nd Avenue were bringing more and more foot traffic to the downtown store. So much so that Stan decided to close up his Vestavia store and bring Storkland back downtown! Here's a great article from Mike Tomberlin on the move. I'm excited that more and more of 20th Street is open after 5pm. Cafe Dupont, Bistro 218, and some nights Brick and Tim. There are so many restaurants on that street that are open during the day that are just begging to extend the 2nd Avenue nightlife. Hopefully Paramount and the recently opened Olivia's will help bridge the gap between the current 2nd Avenue scene and 20th. Want to see El Barrio before it was a restaurant? Check out Joe Walker's video! Alabama Symphony Orchestra Concert... IN MY LOFT! One of the Junior Patrons of the Birmingham Museum of Art saw my loft during the Loft Tour back in May, and had an idea to have a joint event with the Alabama Symphony Orchestra. 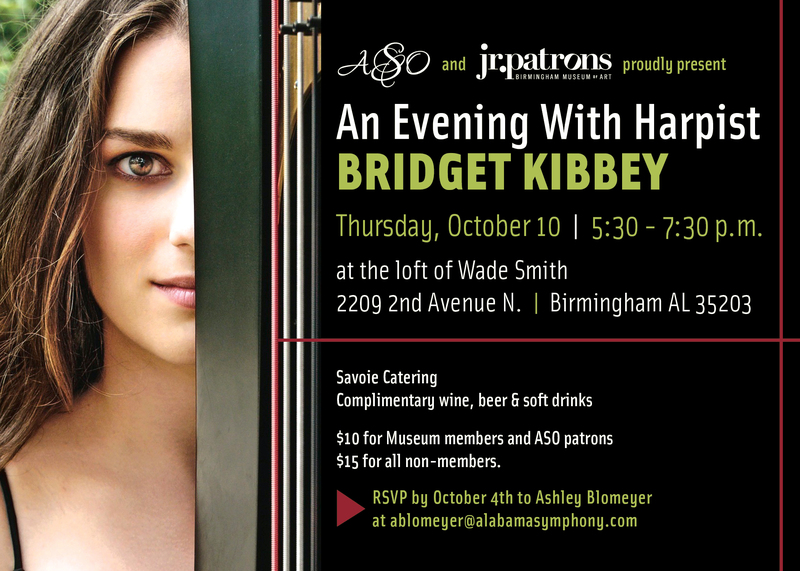 The concert will be held on October 10th featuring Bridget Kibbey, a young harpist who just won the Avery Fisher Award. What?! You don't know what the Avery Fisher Award is? What kind of barbarians are reading the blog?! Luckily for all of you barbarians out there you're still invited, but you better act fast because there's a limit of 50 attendees. Something about a fire code, I imagine. I gotta admit that I was a little sad to see the sign go down on the Metro Bar, formerly Metro Bistro. Before 2nd Avenue was a destination spot, Metro was there providing all of us locals a place to get a drink and meet up. From spaghetti nights to music to karaoke to trivia, I've got a lot of great memories at the Metro. For better or worse, the clientele in the area has changed a lot over the past 8 years since I've been downtown, and the Metro had seen a decline in business. The foot traffic has gone from locals of all ages dressed almost pajama casually walking around their neighborhood, to nattily dressed twenty somethings looking to hook up at a place with a more upscale feel than the Calculated Dive that was the Metro. I was really excited to hear that Andrew Collins from Lyric Hot Dogs had bought it, and that he and Feizal Valli were going to give it a makeover complete with a new name: The Collins. The Accordion Player and I had been sticking our noses into The Collins all during the buildout, but Thursday night we went there for the first time to drink and watch a little football. The Collins has a sleek modern decor, and lo and behold it was full of those same dressed up twenty-somethings that had walked in and immediately out of Metro just a few weeks before. I hated to see the Metro go, but there is just enough of the bones remaining to feel a little bit of nostalgia. The cocktails were awesome. I highly recommend The Collins' version of The Last Word. The Accordion Player had a Hairy Carrie, which is a classic cocktail with a rich history dating from the turn of the century, and if you ask Feizal to make you one I will personally buy you a drink the next time I see you. The website (http://collinsbirmingham.com/) is a little sparse right now, but we were told that is progressing. The site's got the hours, though, which is all I really care about anyway. I love all the restaurants and bars that are open downtown at night, but we need more retail that doesn't close at 3 o'clock! Rev (formerly ONB) is doing a cool project to connect entrepreneurs with available downtown spaces. Also there's a party, and who wouldn't want to go to that? September 30th through October 4th. Come support some fun Pop-Up shops. For more Details visit Streetlife Project.